This textbook is specifically tailored for undergraduate engineering courses offered in the junior year, providing a thorough understanding of solid state electronics without relying on the prerequisites of quantum mechanics. 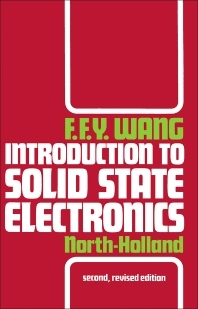 In contrast to most solid state electronics texts currently available, with their generalized treatments of the same topics, this is the first text to focus exclusively and in meaningful detail on introductory material. The original text has already been in use for 10 years. In this new edition, additional problems have been added at the end of most chapters. These problems are meant not only to review the material covered in the chapter, but also to introduce some aspects not covered in the text. An amended Solutions Manual is in preparation. 1. Electrons as Particles. Resistivity and conductivity. Temperature dependence of resistivity. Current and current density. Equation of continuity. Electric field and potential. Electron in electric and magnetic fields. Problems to Chapter 1. Bibliography. 2. Electrons as Waves. Wave-particle duality. Uncertainty principle. Plane wave and wave packets. Energy quantization. 3. Probability and Distribution Functions. Probability. Distribution functions. Maxwell-Boltzmann statistics. Bose-Einstein statistics. Fermi-Dirac statistics. 4. Electron Lifetime, Mobility. Electron lifetime. Boltzmann transport equation. Conductivity and mobility. Measurement of resistivity. Hall effect and magnetoresistance. 5. Wave Mechanics. Wave representation. Schrödinger's equation. Effect of a potential jump. Particle in a box - infinite potential well. Particle in a potential well - finite potential barrier. Tunnelling through potential energy barriers. Harmonic oscillator. The one-electron atom. The periodic table of the elements. 6. Periodic Lattice. Direct lattice. Fourier series. Reciprocal lattice. Diffraction condition. 7. Electrons in the Lattice. Bloch theorem. Electron waves in a periodic potential. Band gap. Kronig-Penney model. Velocity of the Bloch electron. Effective mass. Number of states in a band. Hole. 8. Energy Bands in Crystals. Energy bands. Metals, insulators, and semiconductors. Density of states. Brillouin zones. 9. Carrier Concentrations. Density of electrons in the conduction band - classical approximation. Fermi-Dirac integral. Density of electrons in the conduction band - degenerate approximation. Density of holes in the valence band. Intrinsic semiconductor. 10. Extrinsic Semiconductors. Impurity states. Types of defect. Statistics of ionization equilibria. Law of mass action. Compensation. 11. Lattice Waves. Linear monatomic lattice. Linear diatomic lattice. Phonon. Lattice heat capacity. Lattice thermal conductivity. 12. Mobility and Conductivity. Impurity scattering. Phonon scattering. Mobility. 13. Ambipolar Transport. Diffusion current. Direct recombination. Recombination centers and traps. Ambipolar transport. Haynes-Shockley experiment. Photoconductivity. 14. The p-n Junction. Transition region. Potential distribution in the transition region. The p-n junction. Simplified model for p-n junction. Depletion approximation. 15. Semiconductor Surfaces. Surfaces. Surface states. The space-charge region. Surface excess of carriers. Metal-semiconductor contacts. Metal-insulator-semiconductor structure. List of symbols. References. Appendix I. Physical Constants. Index.